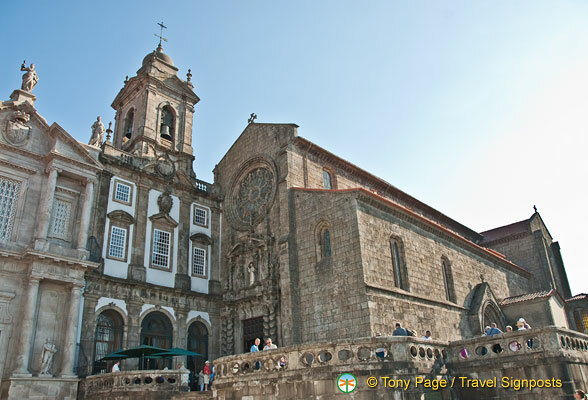 The exterior of Igreja de São Francisco does not excite people to want to dash into the church to have a look. From the outside, this 13th century Gothic construction looks rather plain and lacking in architectural grandeur. But, step into the church and you’ll be gobsmacked by its extravagant and opulent interior. Certainly, this is the most extraordinary church interior in Porto and all of Portugal. São Francisco was built in the 13th century, but it is its 18th century Baroque interior that stuns visitors. The High Altar is weighed down, not by the sins of parishioners, but by over 200 kg of gold gilded onto columns and pillars, cherubs, plants and animals. The star attraction is the Tree of Jesse. São Francisco’s Tree of Jesse was carved between 1718 and 1721. A popular Bible teaching during that time was Christ’s genealogy, in particular, showing his descent from the Kings of Judah and Israel. Before literacy was common amongst people, these teachings were very often expressed as biblical events in stained-glass windows or elaborate carvings such as the Tree of Jesse. The Tree of Jesse is believed to have been adapted from an earlier piece of work. Carved in multi-coloured wood, it shows the figures of the twelve Kings of Judah connected by the branches of the tree which sprouts from a reclining Jesse of Bethlehem. At the top of the tree is Jesus Christ with the Virgin Mary and Joseph. Whilst the Tree of Jesse is the main and the most important sightseeing attraction in São Francisco, there are many other interesting altars and chapels that should not be missed. On entering the church a statue of St. Francis of Assisi stands in an alcove on the right. St. Francis Museum and the Catacombs are below the church, but we didn’t have time to visit these. São Francisco was once described by Count Raczinsky as the “Golden Church”. 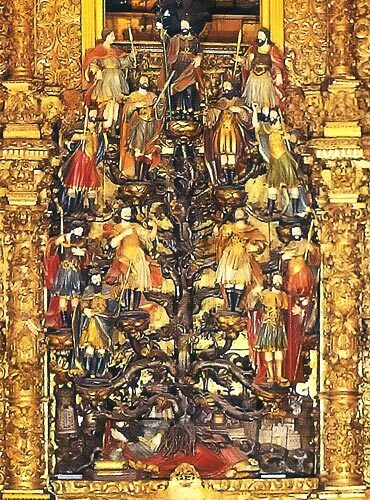 Its exceptional gilded wood carving is one of the most beautiful in Portugal. Our tour director was very fond of surprising us with “treats” on our trip and this visit to São Francisco is certainly a visual treat and a must-see for anyone visiting Porto. Church services are no longer held here, but it is often the venue for classical music concerts.